You can save on freight charges by buying from your nearest stockist. Check our Stockist page to find your nearest retailer. Did you know that when you buy The Hanley Formula online or from your retailer, money from your purchase is going directly towards supporting kiwi rescue horses? 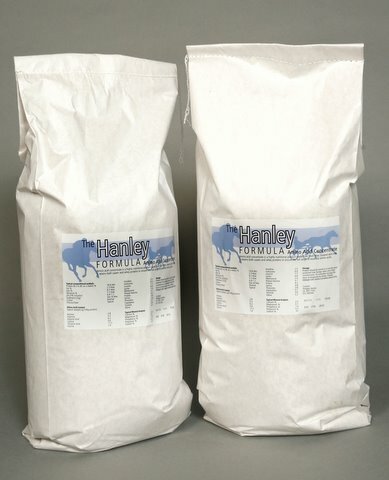 This huge maxi sack is the most economical way to purchase The Hanley Formula and with its long shelf life (minimum of 3 years from manufacture if stored correctly) it is a must have for every equestrian feed room. Will last a large horse in hard work 130 days (100 grams per day), after their initial muscle building programme of 200 grams per day for 35 days. This 7 kg pack contains the amount of formula necessary for a complete muscle building programme for a large horse in hard work or needing lots of muscle improvement. Your bag will last longer if your horse is smaller and is in lighter work. Contains 15 days worth of high dose muscle building for a large horse in hard work (200 grams per day ), or 30 days for lower requirements of smaller horses or lighter workloads. This pack is ideal for finishing horses off in the last few weeks before sales or competition. Also excellent for maintaining horses already in peak condition where the 3 kgs will last approximately 60 days when fed at 50 grams per day.